The Book of Zechariah is a book of the Hebrew Bible and Christian Old Testament attributed to the prophet Zechariah, who prophesied after the Babylonian exile during the rebuilding of the Temple of Jerusalem. The eleventh of the 12 books of the minor prophets, the Book of Zechariah contains several powerful visions, including one in which people from all nations come to attend the Temple of Jerusalem. The rebuilding of the Temple is portrayed as the necessary prelude to the coming messianic age. The prophet seemed to pin his messianic hopes at first on Jerusalem's governor, Zerubbabel, the descendant of King David who supervised the rebuilding (Zechariah 4:7), and also on the high priest Joshua, whom Zechariah identifies as "the Branch" who will bring God's salvation. The later chapters of the Book of Zechariah are thought by many modern scholars to come from a different, probably later, writer. To Christians, they speak in several passages of a Messiah who suffers, an interpretation which had a major impact on Christian writers of the New Testament. Zechariah's early visions—such as the apocalyptic four chariots and their colored horses, the seven lampstands, and two olive trees—strongly influenced the writing of the Book of Revelation. In Jewish theology, the book contributed to the tradition of apocalyptic literature prior to the first century of the common era and gave rise in some segments of the Jewish population to the expectation that there would be not one, but two messiahs, a kingly descendant of David and a priestly descendant of Aaron. Darius the Great reigned over the Persian Empire in the time of Zechariah. Zechariah’s ministry took place during the reign of Darius the Great (Zechariah 1:1) and was contemporary with Haggai. 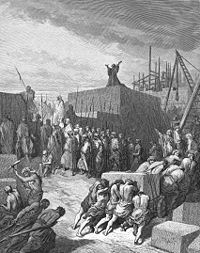 After the fall of Jerusalem in 587 B.C.E., many Jews had been exiled to Babylon and during his time had been allowed to return to Jerusalem and begin rebuilding the Temple of Yahweh there. Earlier, the prophets Ezekiel and Jeremiah had written both prior to the fall of Jerusalem and during the period of exile. 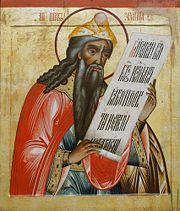 Scholars believe that Ezekiel, with his blending of priestly ceremony and prophetic vision, heavily influenced the writing of Zechariah 1-8. Zechariah is specific about dating his writing, and most scholars put that date at 520-518 B.C.E. 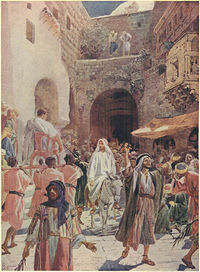 After Cyrus the Great overthrew the Babylonians and allowed the Jews to return to Jerusalem, the first wave of the return took place under a Jewish prince known as Sheshbazzar (Ezra 1), who some commentators believe is identical with Zerubbabel, but others believe was simply his predecessor. 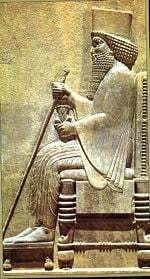 After the death of Cyrus in 530 B.C.E., Darius consolidated power and took office in 522 B.C.E. His system divided the different colonies of the empire into easily manageable districts overseen by governors. Here, the name of Zerubbabel comes into the story, a descendant of King David appointed by Darius as governor over the district of Yehud (Judah). Zechariah also emerged during Darius' reign, centering around the rebuilding of the Temple. Unlike the Babylonians, the Persian Empire went to great lengths to keep cordial relations with its vassal states. The rebuilding of the Temple was encouraged by the Persians in hopes that it would strengthen cooperative authorities in their local contexts. This policy was good politics on the part of the Persians, and Cyrus had attributed his support of the restoration of local shrines to the god Marduk; but the Jews viewed it as a blessing initiated by Yahweh. According to the Book of Ezra, controversy broke out when Zerubbabel and the high priest Joshua refused to allow the local inhabitants who also worshiped Yahweh—the future Samaritans—to assist in the rebuilding process. Opposition to the project then arose, and construction was halted. However, it was only during the reign of Atraxerxes, considerably later than Zechariah's ministry, that the work was completed, when Ezra was sent by the new Persian ruler from Babylon with a new wave of exiles and clear authority to complete the work. Zeruabbel and Joshua begin the rebuilding of the Temple. Zechariah's name means "God has remembered." He describes himself (1:1) as "the son of Berechiah, the son of Iddo." In Ezra 5:1 and 6:14 he is called "the son of Iddo," who was probably his grandfather. His prophetical career began in the second year of Darius of Persia, about 16 years after the return of the first company from their Babylonian exile. He was contemporary with Haggai (Ezra 5:1). Zechariah expressed an urgent hope that the rebuilding of the Temple of Jerusalem will usher in a messianic age. Given the fact that a descendant of King David, Zerubbabel, ruled as governor of Judah during this time, this hope was immediate and conceived in historical terms. 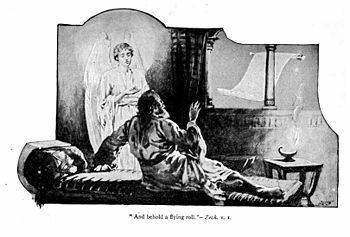 Probably a priest himself, Zechariah also placed great hope in the high priest Joshua (also called Jeshua or Yeshua), who seems to have even eclipsed Zerubbabel in Zechariah's subsequent messianic vision. In the New Testament, Zechariah is apparently confused with another prophet by the same name, Zechariah son of Jehoiada, who was killed in the Temple area for speaking out against King Jehoash of Judah (2 Chronicles 24:20-21). In Matthew 23:35 and Luke 11:50-51, Jesus seems to refer to this earlier Zechariah as "Zechariah son of Berechiah." A tradition preserved in the Lives of the Prophets states that Zechariah actually died a peaceful death "when he had attained a great age" and was buried near Haggai. There is no consensus as to the precise date and authorship of the Book of Zechariah. Although there is no doubt that Zechariah was a historical person and that some of his prophecies are preserved in the book, many scholars do not accept the book as having been written by one individual. Chapters 1–8 are often treated as being the work of the "original" Zechariah. His followers or other prophetic writers are then seen as composing chapters 9–14. In this view the character of the original prophet is to be found within the visions of chapters 1–8. Many contemporary scholars speak of at least two additional writers besides the historical Zechariah, known as Deutero- and Trito-Zechariah. This is based in part on the existence of two distinct "introductions" (9:1 and 12:1), setting apart what appear to be separate sections with distinct styles and concerns. These are often dated to the fourth and third centuries B.C.E., respectively. Much of these sections consist of denunciations of Judah's enemies and predictions of Jerusalem's future greatness. These chapters are also notable for several depictions of a suffering messianic figure that seems to have influenced later New Testament writers in their portrayals of Jesus. Some commentators, however, see no reason to doubt that the entire book was written by the historical Zechariah. Finally, some analysts regard certain sections of the second part of the book as older than the first, and as pre-exilic in date. 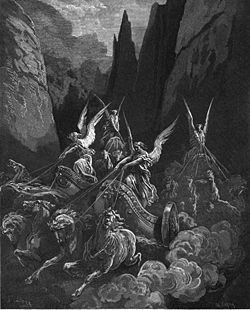 Zechariah's vision of the four chariots, engraving by Gustave Doré. For Christian writers, Jesus' triumphal entry was a fulfillment of Zechariah's prophecy concern the messianic king riding on a "colt, the foal of a donkey." The book begins with a preface (1:1-6), which recalls the nation's past history, for the purpose of presenting a solemn warning to the present generation. Then follows a series of eight visions (1:7-6:8), succeeding one another in one night. These may be regarded as a symbolic history of Israel, intended to furnish consolation to the returned exiles and stir up hope in their minds, centering on the rebuilding of the Temple. The governor Zerubbabel and the high priest Joshua (6:9-15) are objects of the prophet's special, seemingly messianic, hope. Chapter 2—Zechariah sees a builder with a measuring line who is about to survey the holy city. God himself will serve as the city's walls, and those who remain in exile are exhorted to return immediately. Chapter 3—The prophet beholds the high priest Joshua. Satan accuses him of corruption but Yahweh rebukes Satan for this. Joshua's sins are cleansed, he is dressed in clean priestly garments, and is commanded to govern according to God's ways. God will soon send a messianic figure called "the Branch." Chapter 5—A 30-foot long flying scroll appears, containing a curse against thieves and perjurers. The prophet also beholds a measuring basket, in which the sins of the Jews are to be weighed. The basket is transported through the air by two women with storks' wings to Babylon. Chapter 6—Zechariah beholds a vision of four heavenly chariots: "The first chariot had red horses, the second black horses. The third white horses, and the forth chariot dappled gray horses." He is then commanded by the angel to place a crown on the head of the high priest Joshua, who is now identified as "the Branch" and will reign as both priest and king. Chapter 7—Two years later, a delegation from Bethel comes with a question for "the prophets" as to whether the days of mourning for the destruction of the Temple should be kept any longer. God responds through Zechariah to the effect that the real question is whether the people and their rulers are doing justice. Chapter 8—God reiterates his plan to show mercy to Jerusalem and bring about the return of more exiles. The times of fasting will be transformed into an occasion for festivals. Men from all nations will cling to the Jews, knowing that God is with them. Chapter 12—An oracle of disaster for those who would attack the holy city: "When all the nations of the earth are gathered against her, I will make Jerusalem an immovable rock for all the nations." The house of David will turn to God in mourning and supplication. Chapter 13—The land will be chastised and the prophets will no longer prophecy. Even God's "shepherd" will be struck. Two-thirds of the people will perish, but the remaining third will be refined until God can truly say "They are my people," the the people reply that "The Lord is our God." Chapter 14—A great battle will be fought over Jerusalem, in which Yahweh himself will stand on the Mount of Olives, which will be split in two. God himself will rule the world, and a great plague will torment the nations which attacked Jerusalem. Ultimately even the Gentiles will join in celebrating the Feast of Tabernacles and worship God as their true king. The early chapters of the book (Chapters 1-6) display an urgent historical hope for the restoration of the Temple of Jerusalem and the ministry of the "two olive trees," especially the "Branch." This figure is clearly identified as the high priest Joshua, while the other "anointed one" seems to be Zerubbabel, the governor, who was of Davidic lineage. The Book of Zechariah's concern for purity, especially in its early chapters, is apparent in its attitude toward the Temple, the priesthood, and the lives of the Jewish people generally. The prophecy gradually turns its hope from the governor in favor of the high priest, and the Temple sanctuary becomes ever more clearly the center of messianic fulfillment. The rest of the book is less specifically historical in its hope, and also more theological and pastoral in its focus. The main emphasis is that God is at work and plans to live again with his people in Jerusalem. He will save them from their enemies and cleanse them from sin, ultimately bringing even the Gentiles to the proper worship of God at Jerusalem. Most Christian commentators read the series of predictions in chapters 7 to 14 as messianic prophecies pertaining to Jesus, either directly or indirectly. These chapters seem to have been much read by Christian writers who sought scriptural basis for the idea the Messiah would suffer. The earlier chapters, meanwhile, had a significant impact on the Book of Revelation, which seems to have used several of Zechariah's themes, such as the four heavenly chariots and their colored horses, the seven lampstands, two olive trees, etc. ↑ Alternatively, "son of Iddo" could refer to a more distant ancestor. ↑ This verse may be the origin of the tradition among some Jews that there will be two Messiahs (anointed ones), one of priestly lineage and ministry, the other of Davidic lineage and kingly mission. Stuhlmueller, Carroll. Haggai and Zechariah: Rebuilding With Hope. Edinburgh: The Handsel Press Ltd., 1988. ISBN 978-0905312750. History of "Zechariah, Book of"
This page was last modified on 5 July 2013, at 15:51.